Remember our cute little neighbor of the furry variety? Well, over the past 6 months, she's done enough of that chewing to break down a portion of the fence — creating a permanent entry point into our backyard with full access to Basil! We are sure both of the dogs felt a sense of victory (even though this was all Ladybug's victory, not Basil's), though as owners and neighbors on either side of the fence — we all felt a little deflated. As she's been chewing, we've been nailing slats back to the fence and building barriers to keep them away from destructive behavior as well as we could. Needless to say, the dogs won this round. 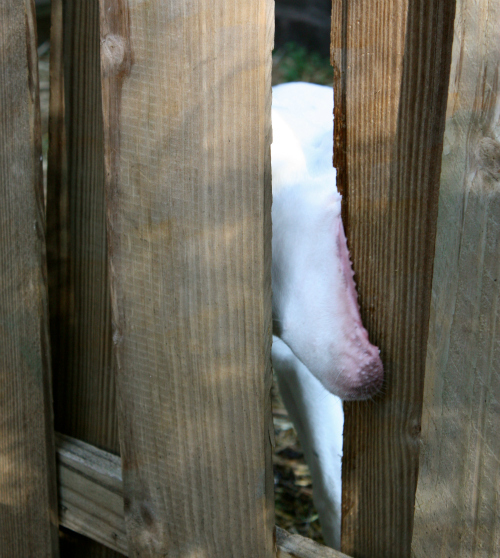 Our house came with a wooden fence on either side of yard — the shorter side is build slat to slat, more like a classic privacy fence. 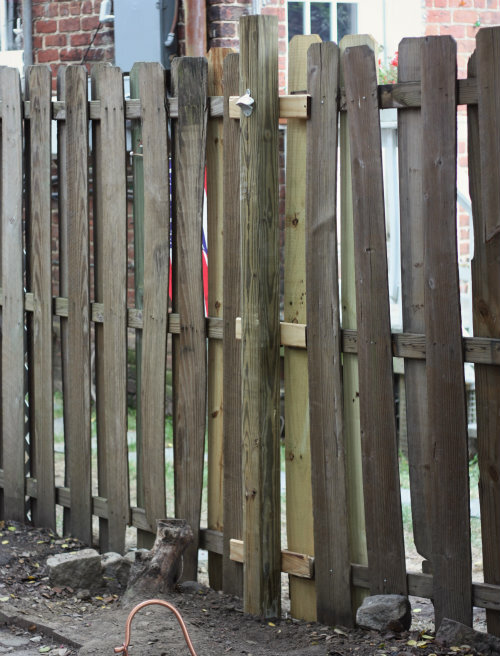 The longer side has alternating slats on either side of the fence, creating the feel of a privacy fence, but more spaced out. We're not sure if this was done to just stretch out the materials or not, but that's what we've got! Down the road I'd like to do something completely different with this fence, but for now, we just needed to get a fix in place to make it functional again. Roger, our neighbor and Ladybug's owner, and I came up with a plan to repair and patch this area of the fence. 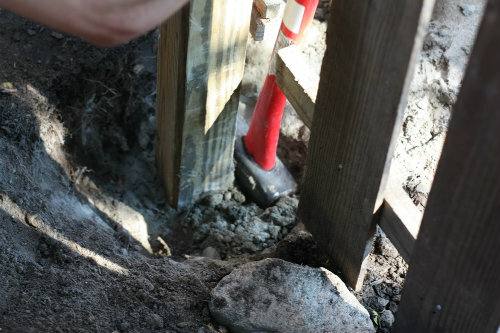 There had been a weak point in this spot, partially due to one of the anchor posts being loose, making it off level and allowing the fence to sag. 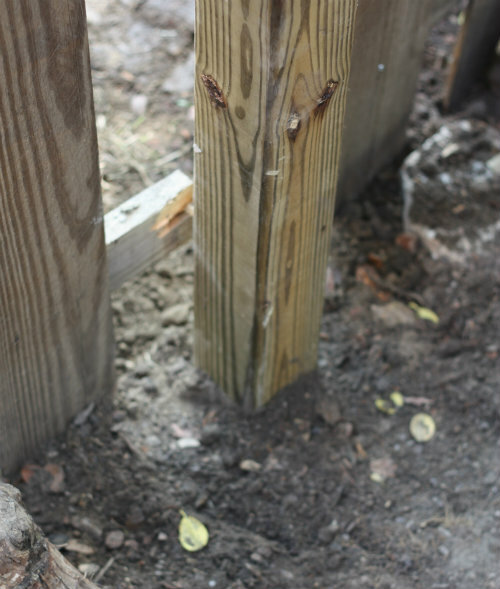 We decided to remove the entire post, reinstall a new one, set it in concrete, then repair and reattach the surrounding fence with a few batch slabs to the newly set anchor post. 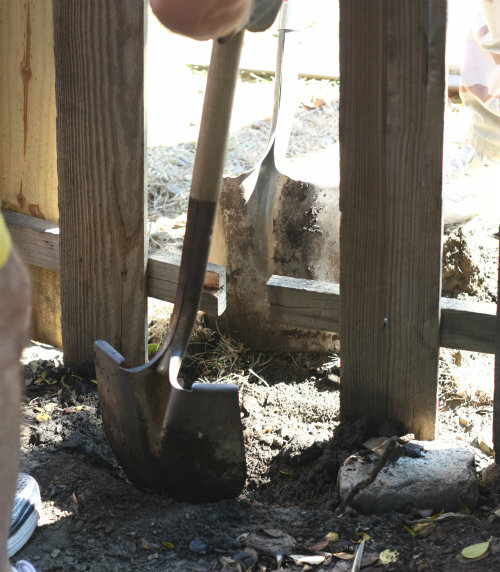 To get things started, we needed to break away the remaining fence from the weak anchor post. Then we began rocking the post back and forth to try to pry it from the ground — this is where the toughest part of the job came in. 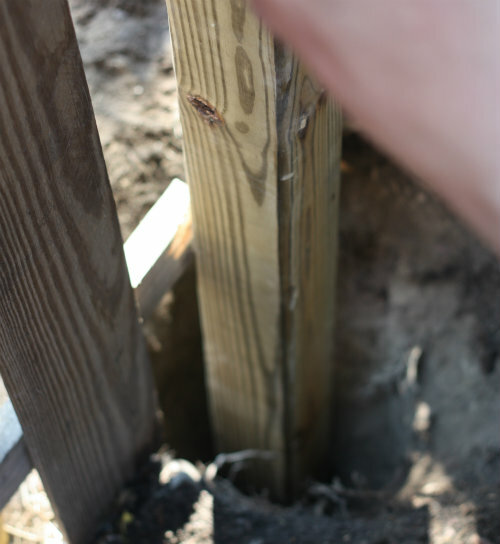 Eventually, the post lifted right out of the ground. 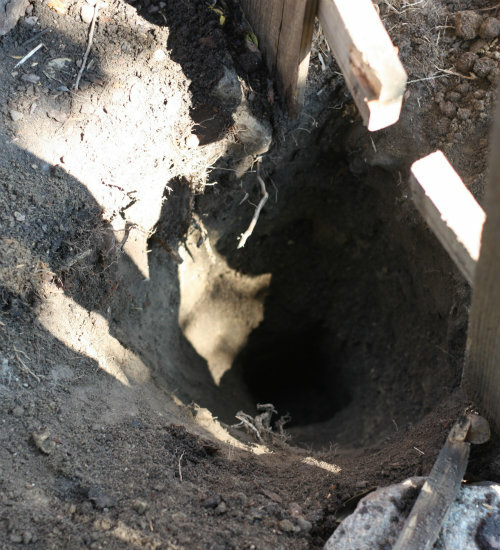 We realized there was no concrete surrounding it previously and that the base of the wood had rotted, which is probably partially why it became weak and sagging. After what seemed like forever, we finally got it loose and pulled it from the ground. 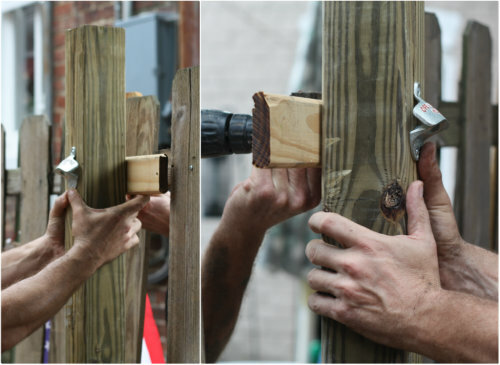 Roger had the new post ready to go, so we immediately wedged it into the ground where the hole from the other board was removed and began to sledge it down as far and tight as we could go using — you guessed, a sledge hammer. 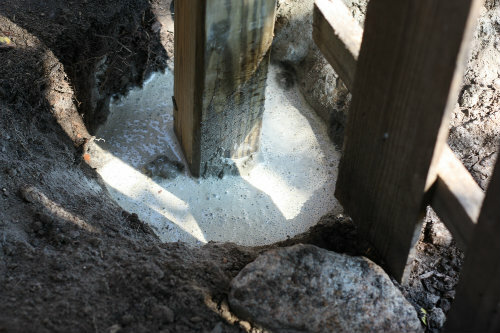 Once the post was in the ground steady and tight, we leveled out the board before mixing up a healthy batch of quickrete (quick drying concrete) and filling in the area around the bottom of the board. Here's where we let out one of those Tim the Toolman Taylor type "ARGH ARGH ARGHHH's," knowing it would take years of chewing for Ladybug to break through the setting we'd just grounded in place. 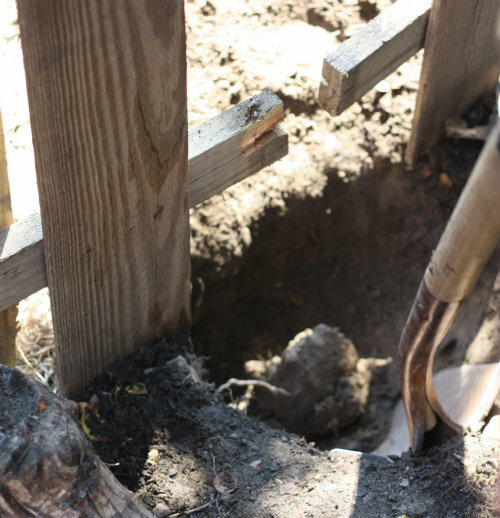 After the quikrete set up and dried (about 30 minutes), we filled in and packed down dirt into the remaining hole and got started on patching the fence slats to the newly set anchor post. 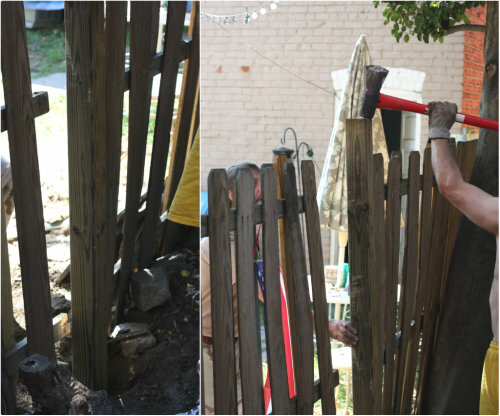 The fence patching was the easy part. We just screwed in 3 small patch boards in line with where the other horizontal boards had been and then screwed new slats on either side of the anchor to bring the remaining fence back in place. 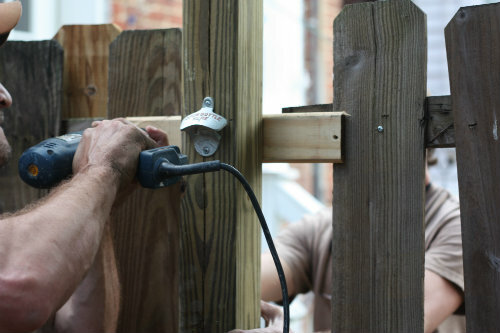 While not our ultimate solution for the look and feel of the fence in our backyard, in the end everything was much more secure and functional. 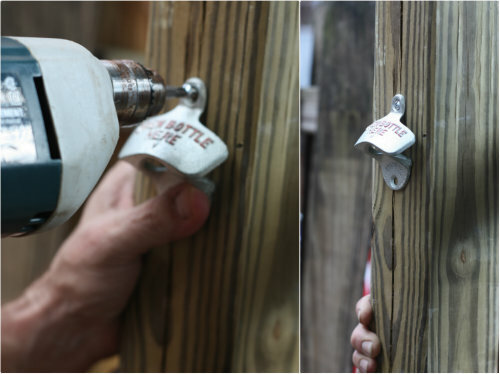 After the job was complete, Roger came over and tested out the new bottle opener, enjoying a couple cold beers and admiring the work we'd just done. 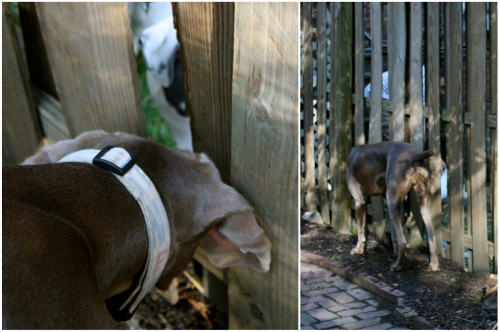 Ladybug was crouched up next to the fence on the other side and we chuckled to ourselves thinking, we won this round. I just know Ladybug will move down just a bit and chew a new way to her dear doggy friend, and there will be another fence mending post in the future. Dogs just gotta chew. 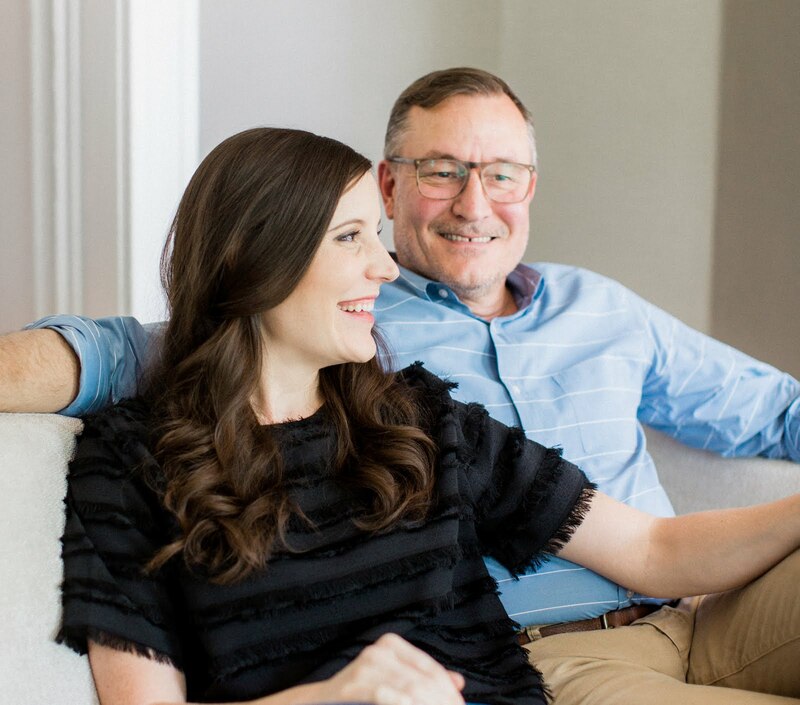 Kelly, Tim here...Now we are talking! Great idea! Has anyone thought about the health effects of the dog chewing on preserved wood ? The chemicals used now are different but I'm not sure I'd want any of my four ingesting treated lumber. 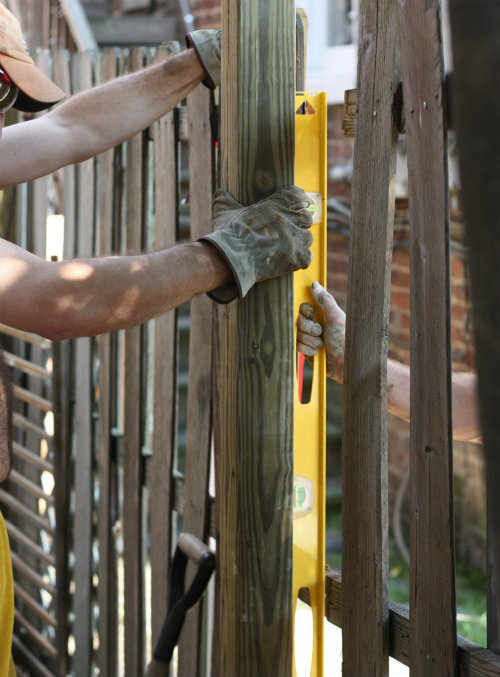 When the fence is damaged then its need to be essential repair.your repair style is great. 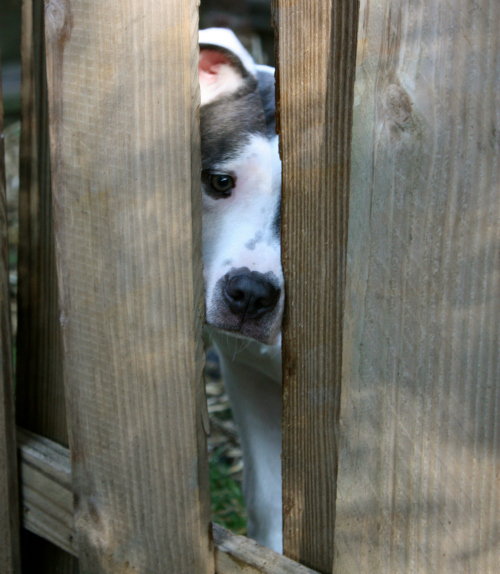 Poor furry friends, I do know they will always find another fence to chew. I think brick fences would also do the thing here, the wood will eventually rot so better stick to a more permanent fence here.